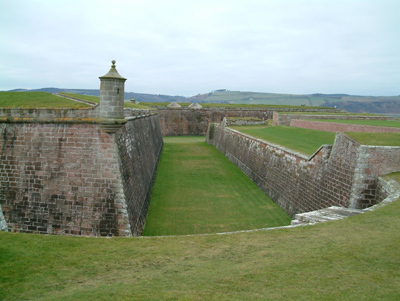 Fort George, in Inverness, Scotland, an 18th century still mighty fortress is in danger of closing because of UK defense cuts. Still a working barracks, it is home to a battalion of the famous Black Watch. The fort defends the sea approaches to Inverness, and is protected on the landward side by loose shale, which would have kept an 18th century foe from dragging guns too close to the walls. Fort George is based on the star design, and has a museum and several re-enactments every year. The previous powder magazine, which could hold over 2,600 barrels of powder, is now home to the Seafield Collection of arms and military equipment.